Via Gellia mills. The modern Viyella label takes its name from the Via Gellia Mills in Derbyshire, bought by then-owner Henry Hollins in the 1890s. The local nickname of the Valley Vi Jella became Viyella the first ever branded fabric to be registered. 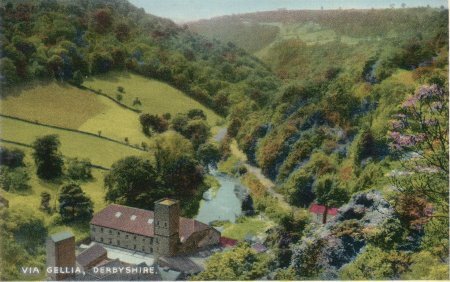 The building in the photo is, as far as I can see, the Via Gellia mills, the small red roofed building just to the right is the Pig of Lead public house at the bottom of Clatterway. Since 2004 the old mill has been partly occupied by The Play Mill, together with another 25 traders. The Slinter Project is responsible for the management of the Slinter Wood Estate and the recently acquired Dunsley Meadows. 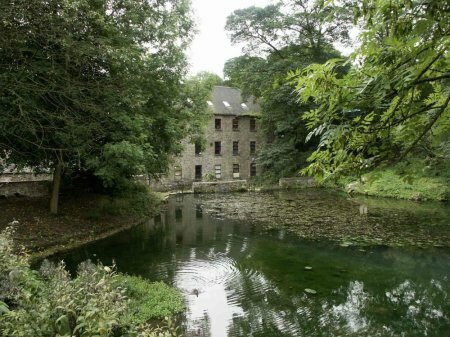 This forms a strip of 51 acres of land, about a mile long, on the south side of Bonsall Valley, from the Cromford corn mill to just beyond the Via Gellia Mills. The bottom of this valley is defined by a series of six mill ponds, much of it forming an attractive wet-land habitat. The valley sides rise about 250ft to form a wooded limestone escarpment. The Dunsley Meadows are a small group of traditionally grazed fields on the west side between the woods and the valley bottom."